On the go or at home, we all live by the power and convenience of batteries. For some, reliably knowing just how much portable power you have is extremely important. But, there’s no need to question how much juice you have left in the current batteries in use, or in batteries tucked away from who knows how long ago. All you need is the simple and handy La Crosse Portable Battery Tester by your side! Convenient and easy to use, just slide a battery inside and squeeze to test. 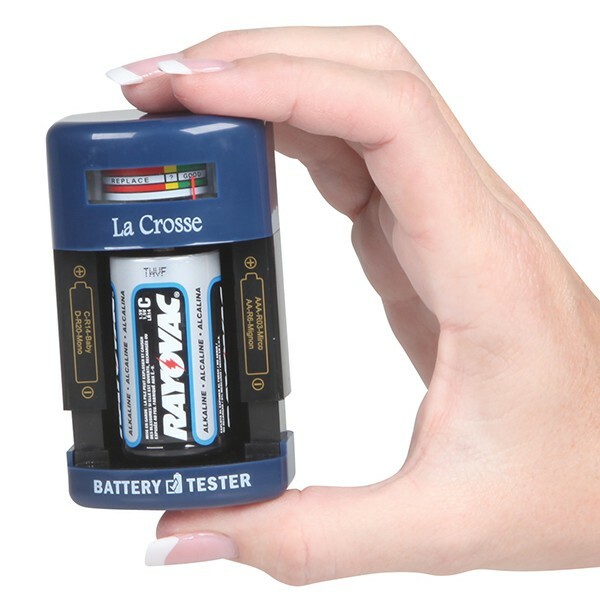 Small and light enough to carry with you on the go, the La Crosse Portable Battery Tester will help you save time and money by letting you accurately test your AAA, AA, C, D & 9-Volt, rechargeable, and alkaline your batteries when and where you need to. It won’t be long before you won’t go anywhere without your La Crosse Portable Battery Tester! To get your very own La Crosse Portable Battery Tester, visit DreamProducts.com.